Have you ever momentarily remembered that you knew something was going to happen before it did? Or maybe, you’ve felt the astonishment of following your intuition and recognizing how it benefited you. If so, you might just have been flirting with being in the Akashic Records! 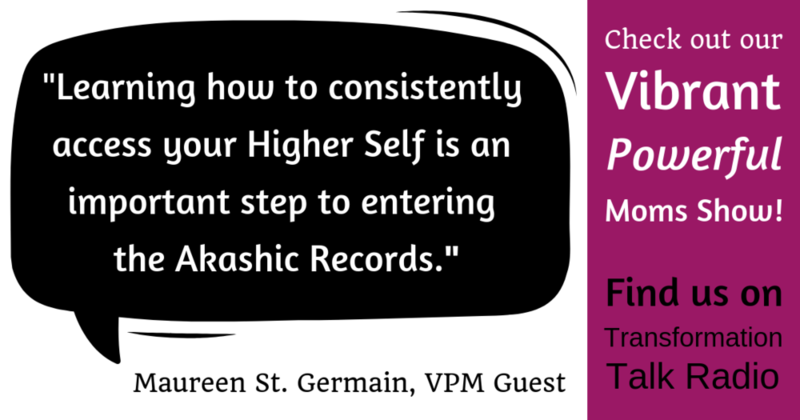 This week I had the honor of interviewing Maureen St. Germain (for the second time), so she could give us some insider information on why having access to the Akashic Records can be a game changer for all of us. As well, during the show you’ll find out what Maureen means when she says spirituality has not caught up with our technology and hear her own fascinating story about her inexplicable fear of her husband and how the Akashic Records helped her understand and heal that. Although it is not advisable to open the Records to gain information about the direction of your child’s life when they are under 16 years of age because they are still ‘playing’ with their path and you could negatively influence that, the Records could be helpful for your own guidance. The level of access you’ll be able to get regarding your child, depends on your level of involvement in their life as well as their age. Focusing your questions on your relationship with your child rather than a future prediction will give you better results. As Maureen touched on at the end of the show, becoming aware of why your child is the way they are (i.e. fearless) can help you understand them better, fill you with compassion and assist you in truly supporting them. As well, Maureen has gifted us with a wonderful opportunity to learn more about the Akashic Records during webinars delivered by her and Lumari… two gifted Akashic Record Masters! Pick yours up here. Finally, below are just a few of my favorite quotes from the show for you to enjoy and share.